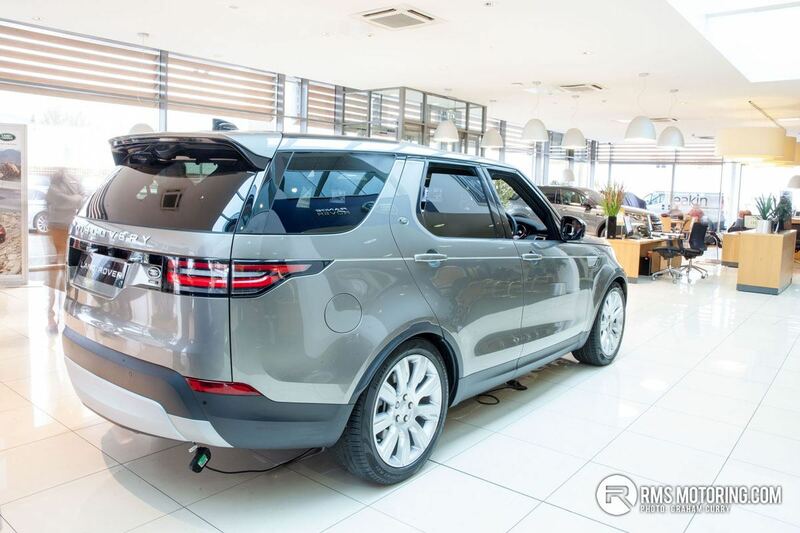 The latest Land Rover Discovery was only unveiled in September 2016 and won’t be on sale to Spring 2017, but RMS Motoring grabbed a first look at the new model, courtesy of Charles Hurst. The fifth generation Discovery breaks with tradition by moving away from the angular, squared off design of previous models. The front is more sculpted and slippery and clearly shares a number of design cues with it’s incredibly popular Range Rover and Evoque stable mates. The end result is the most aerodynamic Discovery to date with a drag coefficient of only 0.33. It’s also much, much lighter, thanks to adopting Land Rovers all aluminum construction. 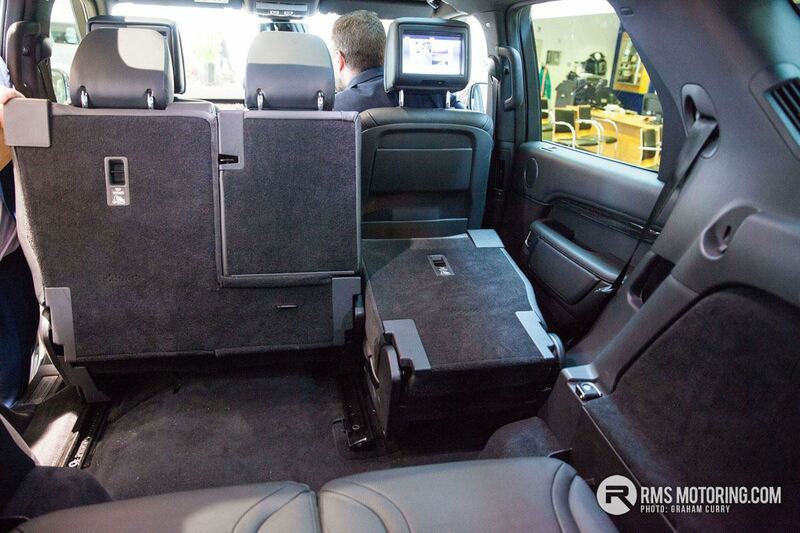 Inside, the Discovery has been designed to have class leading cabin space. It will seat seven full sized adults with ease, however the boot space suffers. Folding the seats back, using the Discovery’s phone app ( yes, really! – in car touchscreen controls are also available or you can use the old fashioned handle method) relinquishes almost two-thirds more space – room for all that weekend luggage. Three engine variants will be offered: a 2 litre twin turbo SD4 diesel with 240 bhp; the more powerful 258 bhp TD6 V6 diesel; and a supercharged V6 petrol, knocking out a full 340 bhp. The new 4 cylinder Ingenium offers by far and away the best fuel economy figures, with Land Rover quoting 43.5 mpg. However, it almost matches the TD6 in terms of performance. Understanably, the SD4 is expected to be the most popular engine choice in the UK and Ireland. The range has four trim options, starting with S (available with SD4 engine only), SE, HSE and HSE Luxury derivatives, with an optional Black Design Pack available on all but S variants. 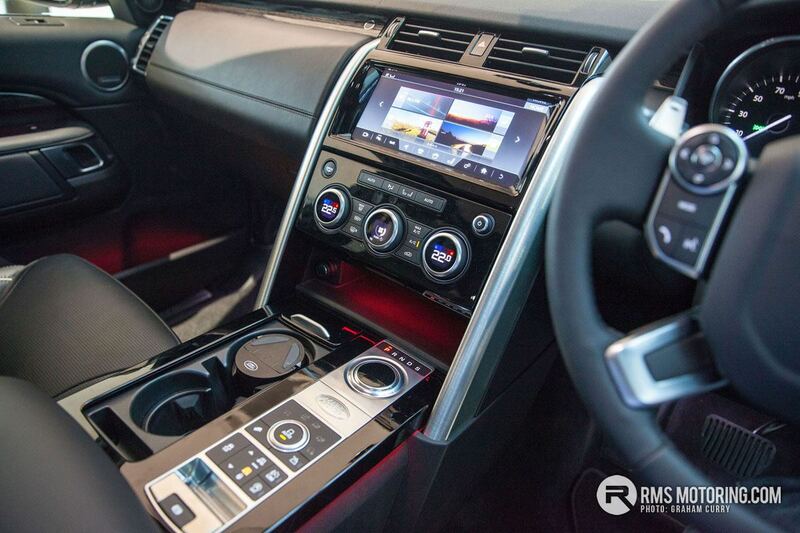 There’s a heavy emphasis on cutting edge technology across all models, including a hold host of electronic wizardry which promises to make light of even the most treacherous off road conditions. But given the market Land Rover are aiming for, it’s hard to imagine that the Disco 5 will see much action off the beaten track. 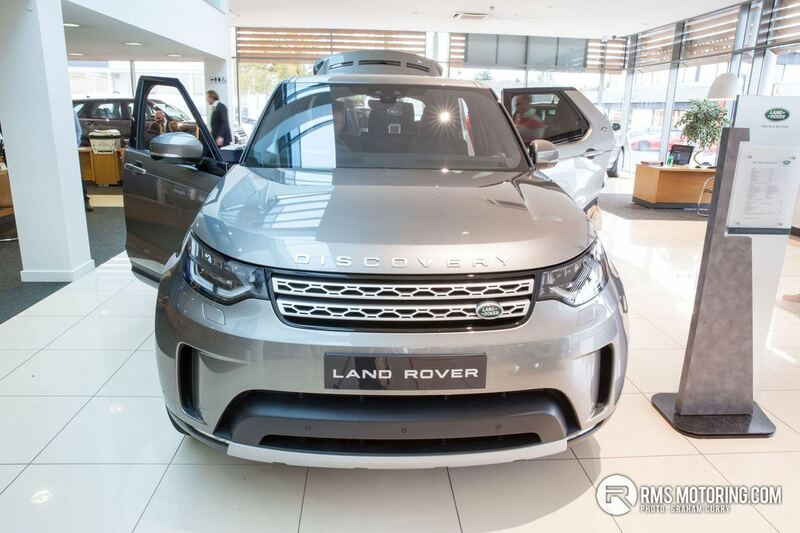 To celebrate the launch of the new Discovery, an exclusive First Edition model, limited to only 600 examples in the UK, will showcase some of the key design and technology features. First Edition models will be available in three colour combinations – Namib Orange / Narvik Black contrast roof and 22-inch black wheels, Silicon Silver with black grille and detailing and 22-inch silver wheels or Farallon Black with 22-inch silver wheels and black grille and detailing.. 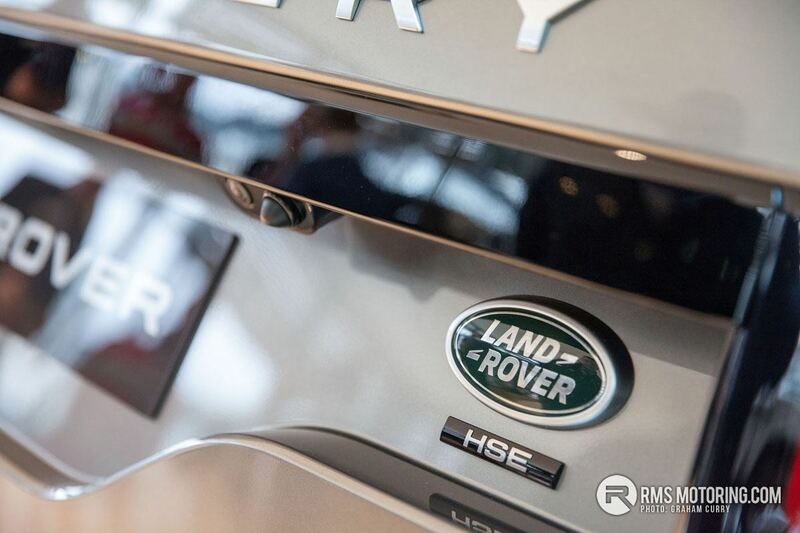 Exclusive details include aluminium interior trim on the facia and doors, featuring an etched map motif in celebration of Discovery’s British design heritage and engineering credentials. Thats loaded to the hilt but much want ! Looking forward to seeing one in the metal, think they are due in work over the coming weeks iirc, Not 100% sure on them at the minute, look like a discovery sport mated with a Sport and this is the love child lol Though they are quite a bit dearer than the Previous shape! 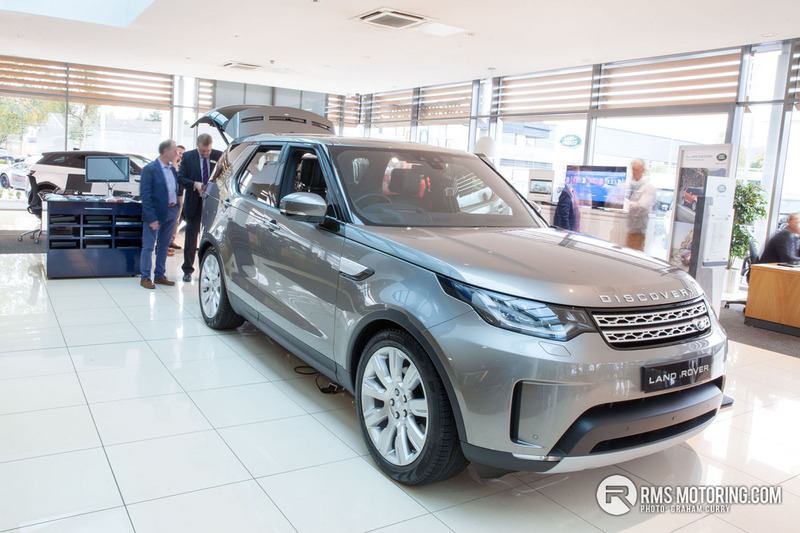 | Looking forward to seeing one in the metal, think they are due in work over the coming weeks iirc, Not 100% sure on them at the minute, look like a discovery sport mated with a Sport and this is the love child lol Though they are quite a bit dearer than the Previous shape! Rear is horrendous, after that wait I'm very disappointed :(. Not that I would've been getting one anyway though! Very clever. You're getting the full Lawn Rover experience right from the web ordering stage lol. Serious money altogether. There, got it under 70K lol ^:o) 126290 | Rear is horrendous, after that wait I'm very disappointed :(. Not that I would've been getting one anyway though! | Very clever. You're getting the full Lawn Rover experience right from the web ordering stage lol. Serious money altogether. If it's anything like the new shape rr it will spend a lot of its life in the garage until they iron out the glitches.